lol..that must have been quite an experience! ask me! i will tell u! blore traffic moves @ 10km/hr! the opportunistic crowd! u'll even understand market dynamics but never can u understand dynamics of blore traffic! ah! dynamic!oops, sorry , it is most of the times static :P but babe! take it from me! u r a goner if u r in koramangala area!traffic is terrible! tatz the one major thing tat'll put u off about blore! hehe. just the other day a friend of mine from bombay was commenting on autowalas in Ahmadabad. 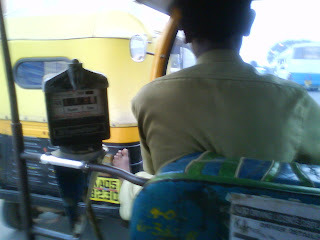 looks like autowalas are the only ppl who can find all sorts of tasks for their feet. apparently ahmadabad auto walas make leg signals for left-right etc, and its totally acceptable and not odd at all. so yeah very definitely, saare jahaan se achcha it is.